Getting rid of the standard road tyres... My Sorento came with Hankook 245/65R17 tyres, which were pretty much a street tread pattern (see picture to the left). The problem is that these tyres are not agressive enough, nor big enought. So, the research begun. Rims... The Sorento's rims are quite a nice design, and as they are Alloys, I was not keen to replace them. Assuming the discs and calipers are not too big, I could possibly have gone back to 16" steel rims, and this may have given me plenty more options. But, they looked good, and ran true (no wobbles etc) and so I decided to stick with them. Size... My criteria here was simple. Go as big as I could without scraping the gards. Unfortunatly, the gards were only about 25mm off the factory rubber when turning, so my options were very limited. Also, the width was limited too. The widest rubber you can put on a 7" rim leagally on all the brands I researched was 255 in a 65 series profile, or 265 in a 70 series profile. But a 265/70 was going to scrape the gards for sure. The 255/65's did not give me a lot of extra height, and it's a fairly rair size, and so that's also not a good iead. So, I settled for 245/70R17, which is the same width as the factory tyres, but 1 profile up, gaining me 26mm in diameter, or 13mm extra height. This does not leave much clearance to the gards, and I am sure they may *just* touch at full lock with full articulation. Mudders vs All Terrains... So, my next choice was to decide how agressive to go. As I do a lot of K's ON-road now-a-days (bummer!) and given that the Sorento is a much quieter and more comfortable car than the Hilux, I did not want to sacrifice too much of it's nice ride. So the decision was made to get All-Terrains. Brand... So, now, what brand? I wanted BFG All Terrains, but they do not make the size I wanted. I researched around 15 brands of tyres, and the only 4 that were listed as available on their Australia web sites were: Cooper, Hankook, General, and Mickey Thompson. So, the phone calls began. Cooper ST's were available at around $350 per tyre. Hankook said the Dynapro AT's were a brand new tyre and not due in for a month, and pricing came in at over $370 per tyre. General Grabber AT2's turned out to be not available at all, despite the web site listing them. 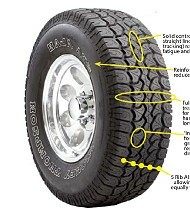 And Mickey Thompson ATZ's were available at around $335 per tyre. 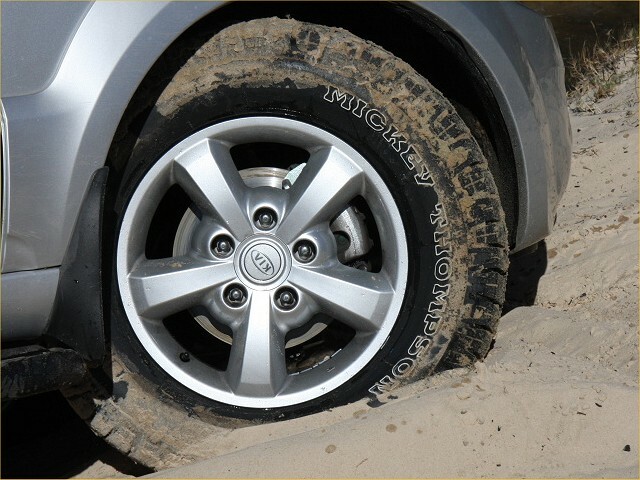 I did quite a bit of asking around tyre shops, and 4WD owners of their experiences with these brands, and ended up settling on the Mickey Thompsons, based on good reputation for longivity, quietness, and off-road performance. Lucky for me, they were also the cheapest, and readily available from Perth 4x4 in Balcatta (thanks Ashley!)... So I bought a set! This page was last updated on 25 May 2009.